It has been four years that we have been rushing over to the Mosque road in Bangalore at the onset of Ramadan. Stranded in Bangalore, a city that feels gentle like morning dew drop but lonely as Mars, where we mostly understand our neighbors’ body language and never fading smile, Mosque road brings back memories of Kolkata Durgapuja. 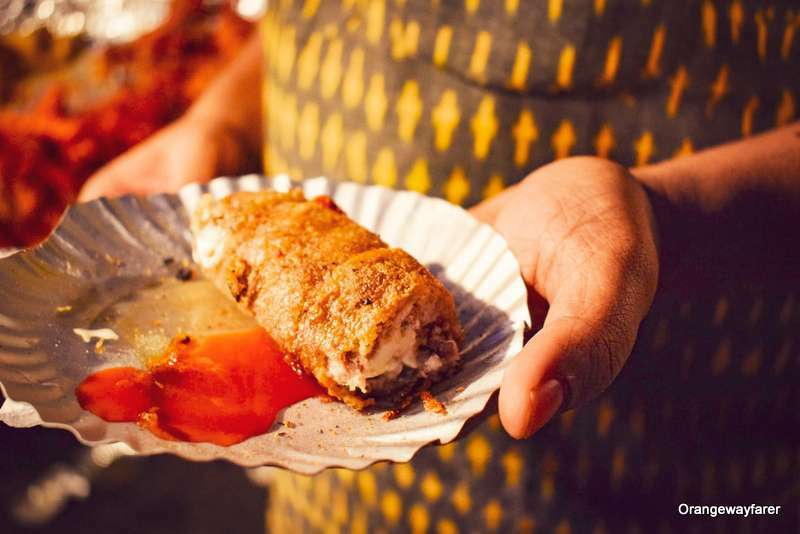 People with or without faith, clad in freshly ironed white kurtas and sparkles of surma on the waterline, gather, move and make merry as the street becomes a fuming, thriving, bustling entity teasing with foodgasmic pleasures. 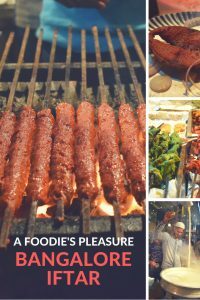 Want to eat good food in Bangalore? Pin it for later! 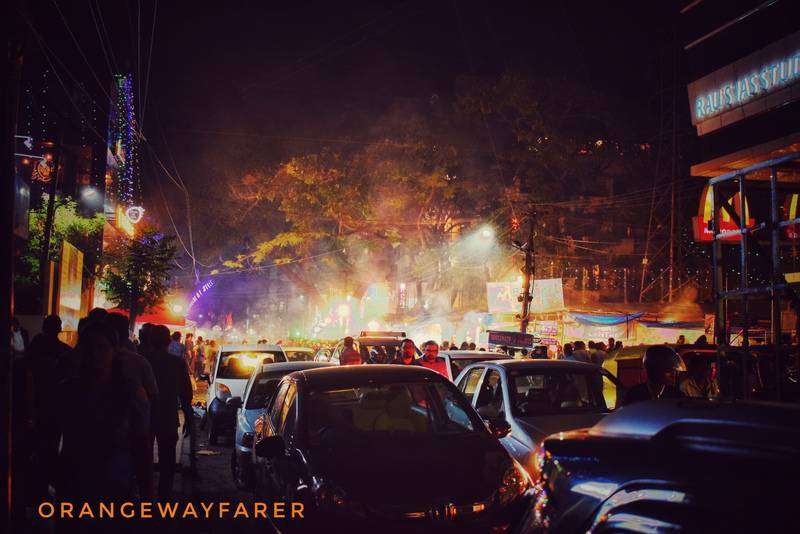 Over the years, the administration decided to distribute the footfall and opened the Koramangala street to join the feast. Though Koramangala has more variety on offer, I still love mosque road more! I am trying to be less poetic and more practical and point out the highlights of the visit from this year. S and I are a couple of the other side of 20s where our digestive system responds well with salad and get muted if we overwhelm them with more ghee and spices. That said, we mostly romanced with chicken and seafood, the grilled variety. 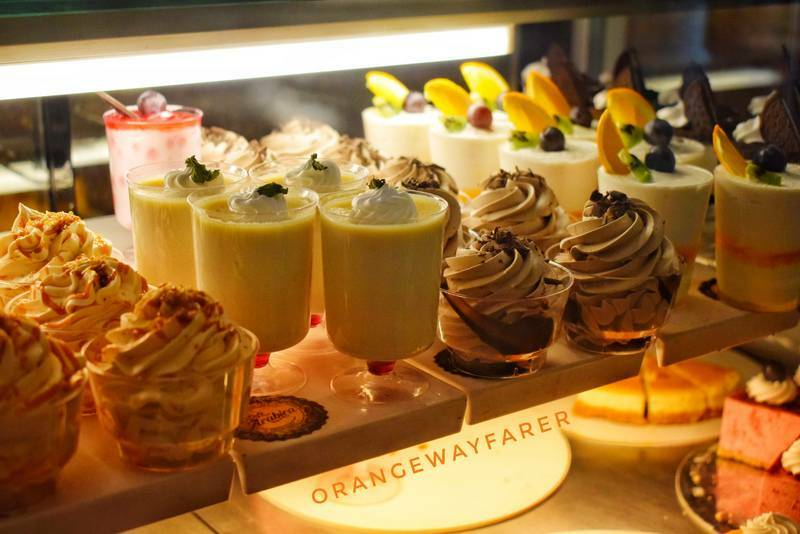 A few bites on desserts did justice. 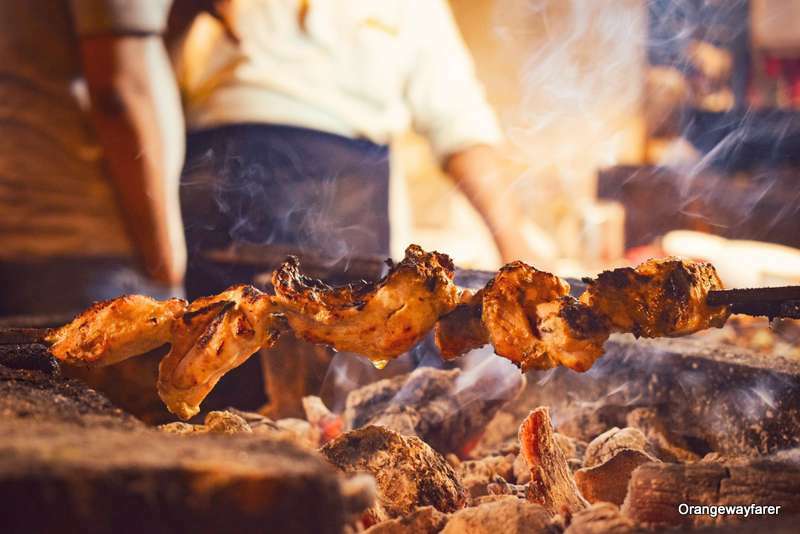 But if you are a fanboy of Anthony Bourdain (or not) and (still) love to taste the best of beef sheek and mutton nargisi koftas, you are reading the right kind of blog, be rest assured! A spread at Cafe Arabica, Mosque road, Bangalore. 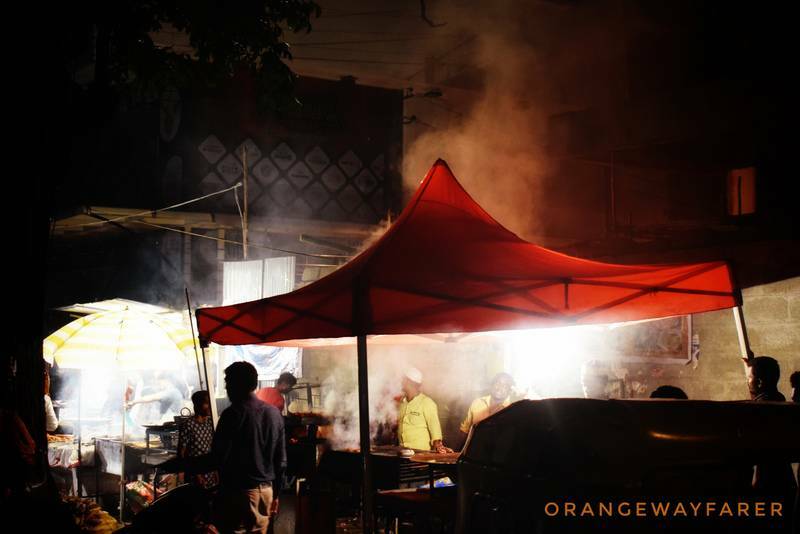 The Mosque Road, Frazer town and Iftar favorites! 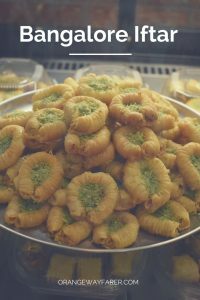 Let us start the show with some sweet beginnings, shall we?Also, historically I have found myself feeling bloated after binge eating the kebabs and packing the Baklavas for the next day, office lunch. No fun, right? I dig them as much as I dig at Roshogolla or Cheesecakes! 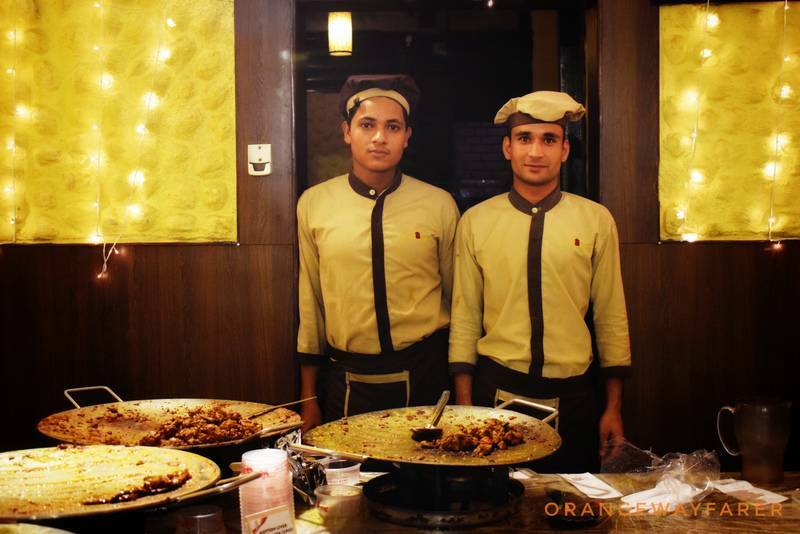 Also read: The quintessential best place to have real Mughlai food in Delhi! 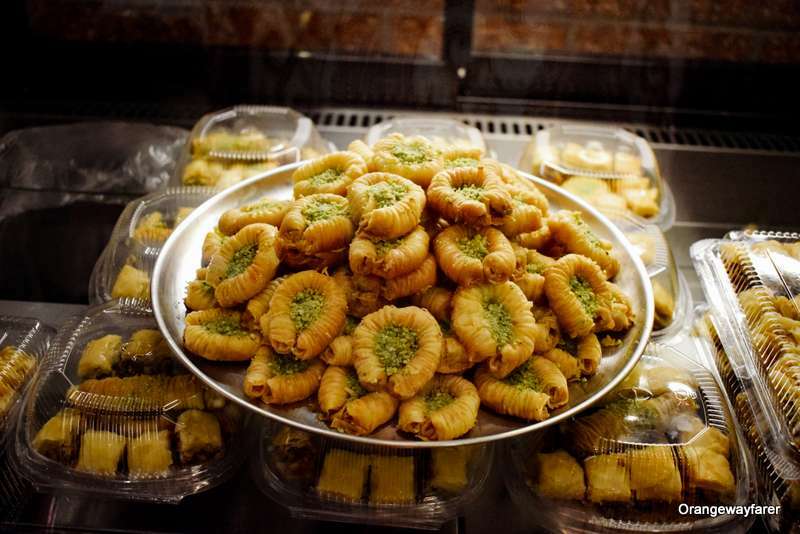 The shop named cafe Arabic a deals with some serious Baklava business. There are many shapes and flavours. But I love my baklavas square shaped and sprinkled with pistachios. Probably this one dish makes Mosque Road stand as a clear winner in my mind, against Koramangala et al. 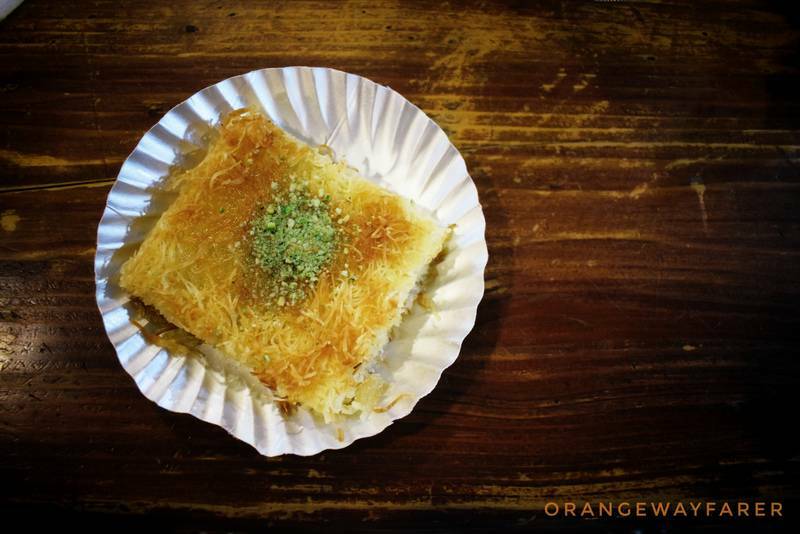 Upon seeing me experimenting with the Baklava plate and a DSLR, the shop owner suggested I try Basboosa. Ironically it tasted better, low on sweet count but I still would go back to the shop and buy another box of baklava, I think! Next to Cafe Arabica, you have a restaurant turned takeaway place only during Ramadan, the Karama restaurant. I love their Mandi rice, in other times. The chef is a Kolkata born and knows the trick of playing with green chilies and chicken. 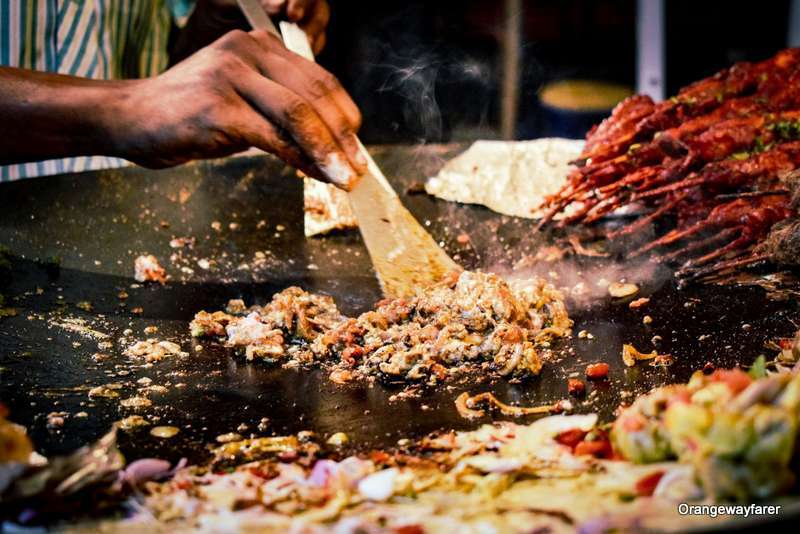 While the entire Bangalore raves about red chilies, dried and black pepper spice quotient, he silently made a revolution in the Karama kitchen which traditionally serves cuisine from Pakistan’s Punjab and Peshawar province. The green gravy! The flavor! The memory! Ah, food blogging could be punishing at times! Karama will help you end the show with fancy coated paans. These are stuffed betel leaves, with no Zarda, and chilled, coated with mango or chocolate or some random flavor you had wished for, may be! 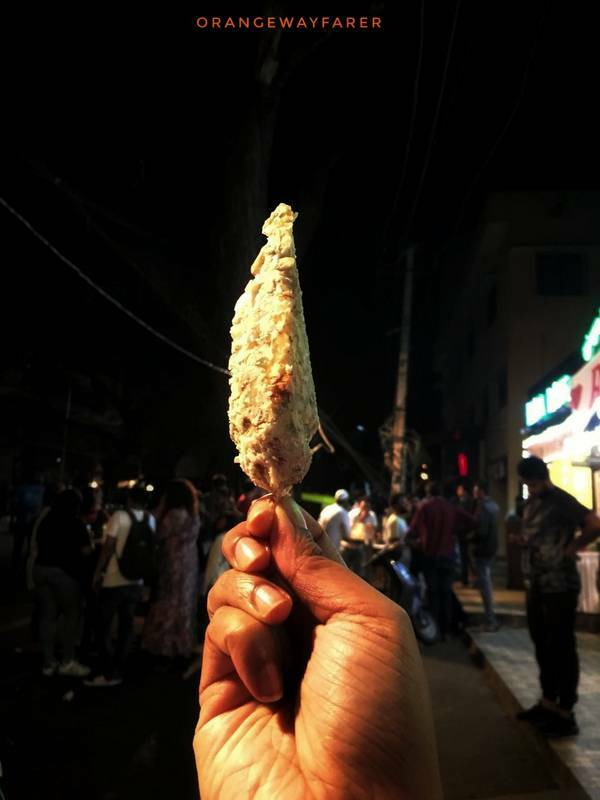 The pocket pinch is not as exorbitant as the rest of Bangalore restaurants, however they are high when compared to the street stalls of Mosque road. 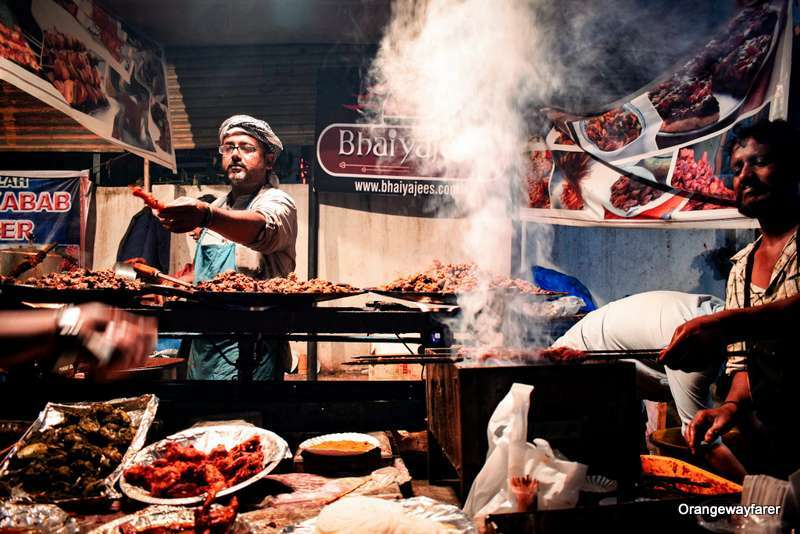 If you are particularly worried about hygiene, Karama is where you should head for. Bheja Fry: To eat or not eat! Sated with the greater meals, it was time to start experimenting with the more adventurous options. One of them being the Goat Brain Fry. The last time I ordered for one, I remember S convincing me, “ It tasted like the Gheelu (brain) of Golda chingri (lobster).” This time, the Hyderabadi’s favourite, came up all decked up with heaves of spices, covering the strange stench. “His picture will come in news paper!” His friends exclaimed! Look at the details, A goat brain turning out to be a delicacy! The final product. I finished it all. S did help! 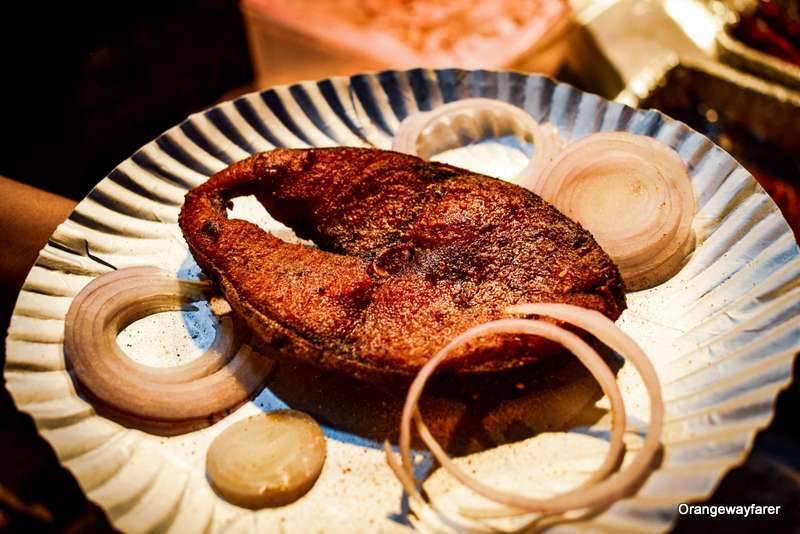 Also read: The traditional Bodo cuisine of Assam and where to eat that! India runs on Chai. You know the proverb is right as you head towards the Savera Chai House. The tea stall has a couple of stoves, always warming a bowl full of milk, ready to be infused with the tea leaves, choicest from Nilgiris! A humble and locally baked cookie may accompany you tea cravings, if not the meat stuffed samosas! 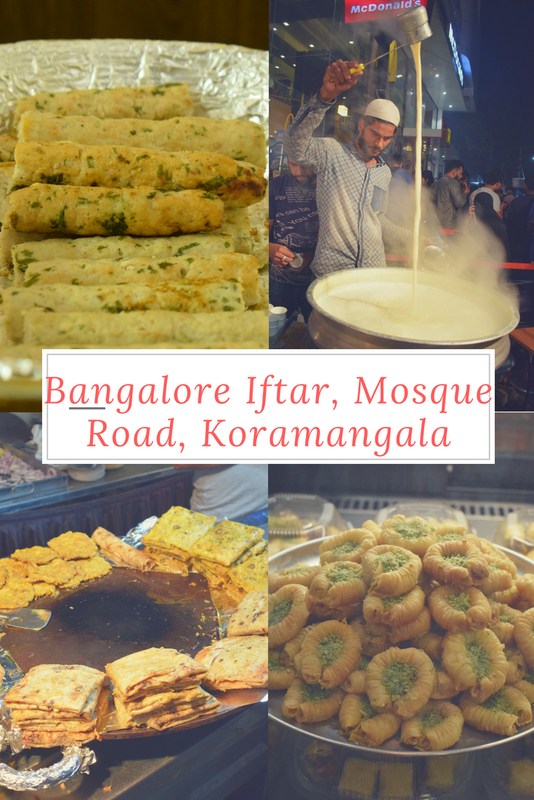 The next weekend, we decided to explore the offerings at Ramadan food festival at the more chic part of the city, Koramangala. This place is dear to me as I studied in Christ university and knew all of the pocket friendly joints of this neighborhood. Know what I mean when I say roads are fuming! 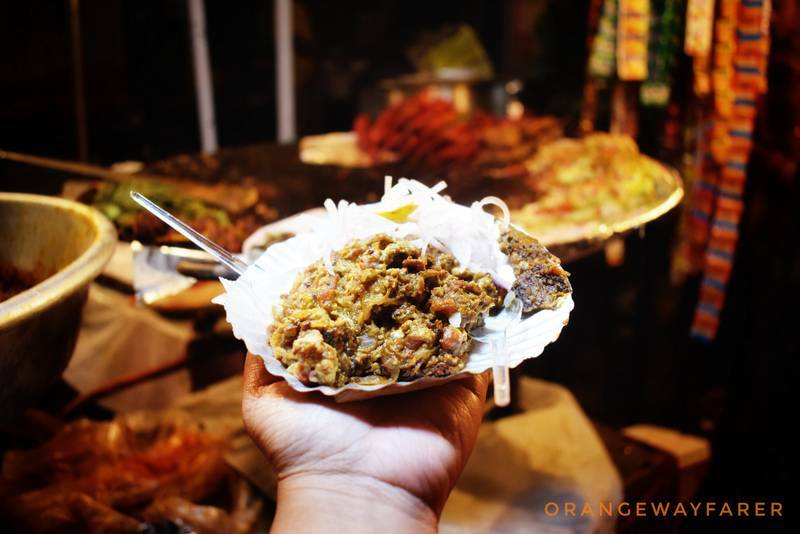 Also read: how Koramangala astounded me last year with Ramadan Food Fest! But before, I go all praises for the food scene, a statutory warning must come: stay away from the place if you are traveling with a car. The road is sealed with people looking for good food, meaning your vehicle will move slower than a sloth. 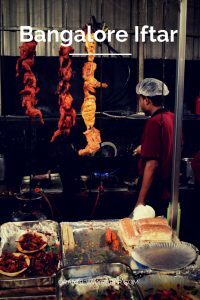 “Weekdays are dull but weekends are hit” told me Raqeeb, the seller of the stall that reads “Food Any Time” on the banner. I tried to stay away from the jostling lane by the side of Empire (thankfully, it is overpriced) and explore the street food scene. The lane next to Mac D is where you should be heading, suggesting you from experience. Only for 100 bucks, this is so good! The sprinkling of Chat Masala is a game changer! King fish fry. I love! Cheese chicken roll, quite innovative addition, I must admit! The tiny stalls are busy with quick bites. 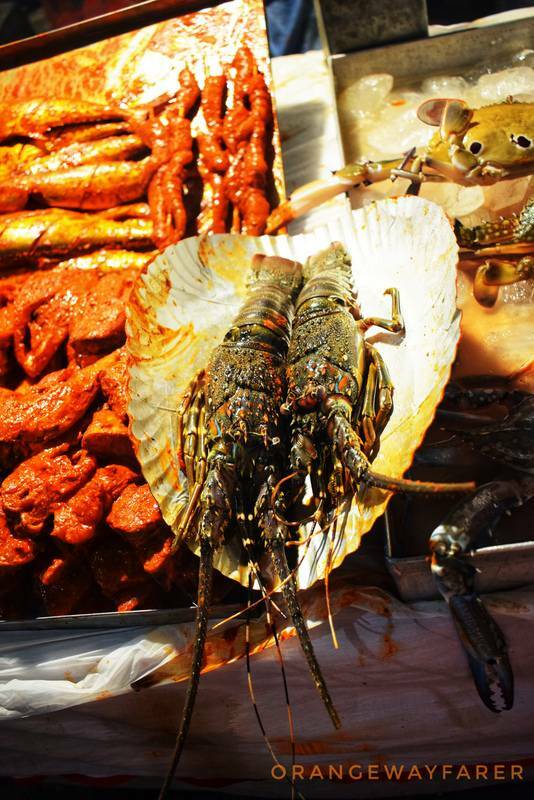 Prawns, King fish, chicken, beef, camel, mutton, crabs: everything is on sale. The chefs are more innovative here, thanks to the more hipster crowd and good old demand-supply economy. Chicken wrapped in cheese rolls have found easy place next to old school Patthar ka ghosht! 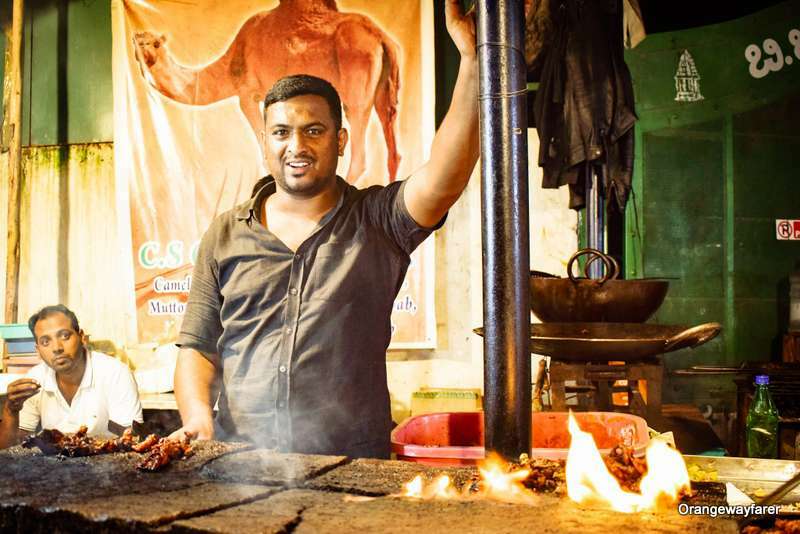 The street is beaming with stalls by the stalwarts like Paradise biryani, Lazeez and Hyderabadi Biryani, all big names of Bangalore food joints. I finally braved the crowd and entered the lane by empire for the sheer pleasure of food photographs, if not the food itself! The dessert scene is pretty quirky and worth exploring! The legacy of good old Arab sellers marrying the rich heritage of Kerala is evident as you take a bite in the pancakes wrapped in banana and coconuts. 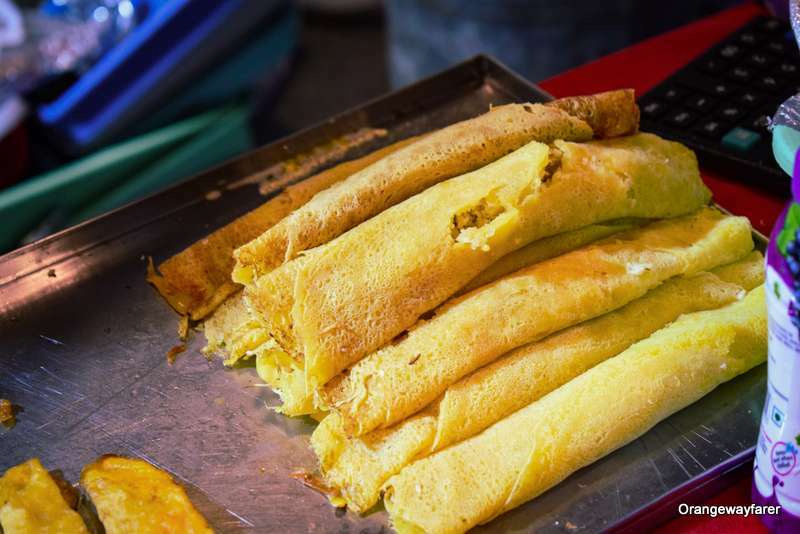 I would happily call it the Bengali Pithe if only the pancake was made of rice flour. 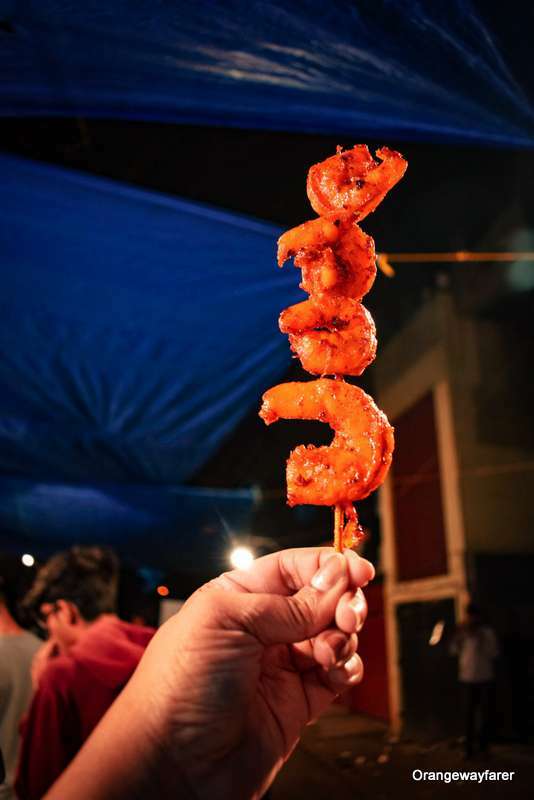 A style of kebab unique to this region of the country, Patthar ka Ghosht demands undivided attention by a first timer at the Ramadan food festival in Bangalore. I remember trying the camel meat last year and felt a never ending rubbery texture in my mouth! To be on the safe side, try out the beef or mutton variety. It is worth all the hype and money. Believe it or not, a red hot stone acts as the griller and cooks the meat till perfection. The legacy of Patthar ka ghosht comes straight out of the court of Hyderabadi Nizams. Haleem: a comfort meal, which is also very rich! I found an outlet claiming to be the legendary Pista house of Hyderabad selling canned haleem at Mosque road. Besides, many small vendors sell haleem on the streets. The slow cooked meal and lentil meal is heavy and best savoured as a meal in itself. You can buy a few naans with it as well. Strongly recommend to bring it back home in a parcel because a portion of it could be heavy. Biryani: need I say more? 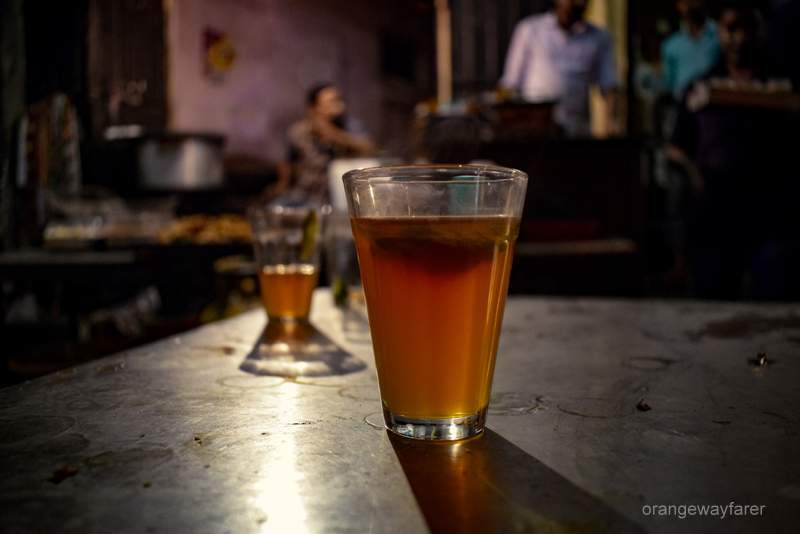 Iftar is Bangalore is the only respite from mundane city life that has been revolving around the vicious cycle of go to office, come back, party on the weekend, resume office with a blue face and plan occasional gateways to rebound the wear and tear of this tired soul. It is not a mandate to have a Muslim friend (though if you have one, head nowhere else for iftar but her home, of course upon being invited) to take part in the iftar food galore in Bangalore. Irrespective of the month of Ramadan, Empire restaurant stays in both the places. So does Karama, Sabera tea house and Cafe Arabica. But to rejoice with the crowd and having the privilege of sharing food with a foodie community, bangalore iftar is your best bait. Do Not Forget before you head out to eat! Do carry your eco friendly kit (water bottles, steel straws) to help save namma city from plastic menace. The place gets horribly littered by the end of the night, even though the vendors clear it up diligently early morning. Make it a point to do your bit. Also, if you are a hygiene freak (and you have all the rights to be so, not judging at all), you may want to stay away from this mass hysteria! Specially when heavens open up and decide to pour on Namma city! If you love fish, stick to selfish only. Only a handful places serve good quality fish, make sure to find one! Only visit once the prayers are over, because your chefs are fasting for the entire day and they get to be doing their iftari first. The later at night you visit, the calmer the streets you find, easy to move. Ask for the price before you buy something. Love the read? Pin it! Want to book a stay in Bangalore? Intrigued by the food? Want to read some good book? I, too, am of the opinion that green chillies offer a fresher, more subtle heat than red chillies. Besides, who can ignore the aroma of a crushed green chilli in gorom ghee bhaat? Those grilled shrimps look delicious and so does the baklava. What’s Mandi rice though? I’ve never heard of it. Many thanks. I love the flavor of green chilies and what is our fish curry without one? Damn I’m ready for dinner now! 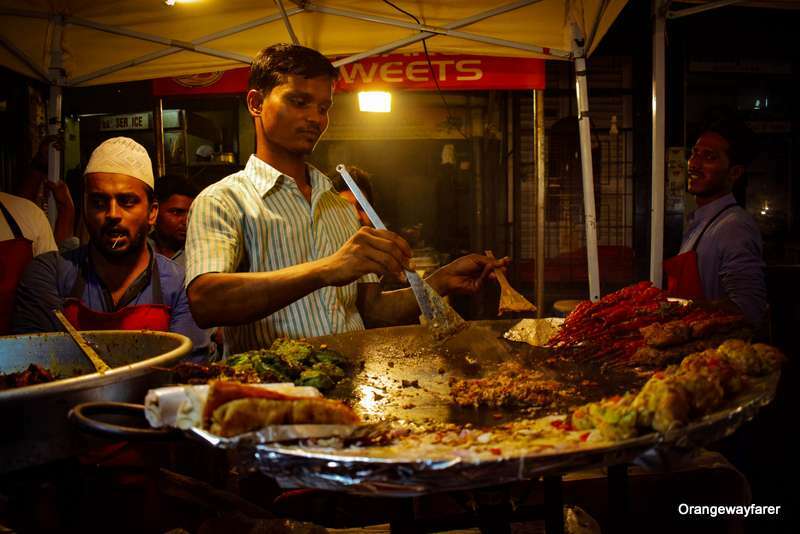 I’m not so good with fasting and all but I’d love to experience Bangalore during Ramadan! If I ever get to Bangalore, I am definitely going to mosque road! You must! I tell you 🙂 and you would not regret it ever! Now I’m hungry! Detailed post with great pictures. Reminds of the time my Muslim flatmate invited me to the local Mosque to break the evening fast. Such a kind gesture. Such a great post! After reading this I feel so hungry haha. The food looks so tasty. Thanks for sharing. Oh my gosh! Goat brain! You are so brave! I will say it actually does look pretty good. What an awesome food festival! Hey great post and very well covered. Being a vegetarian i hv never been to this food festival..but i think i surely can try sweets. Okay, so I just ate a pretty big lunch but I’m pretty hungry after looking at all of this delectable foods. I’m surprised by how diverse each stall was; I gotta get myself there for this someday! Woah this looks like quite the food experience! I love that it all takes place at night and it looks so lively. The seafood there look so decadent and fresh. This is going on my foodie bucket list! Oh my god! This sounds like a dream! I am craving EVERYTHING from this list haha the desserts, the tea, the seafood! Gosh! I’m always in for a food festival, so now I’ve added this one to my list! Thanks for sharing! This food looks punishingly good! I do not recommend ever re-reading it before breakfast. Oops. 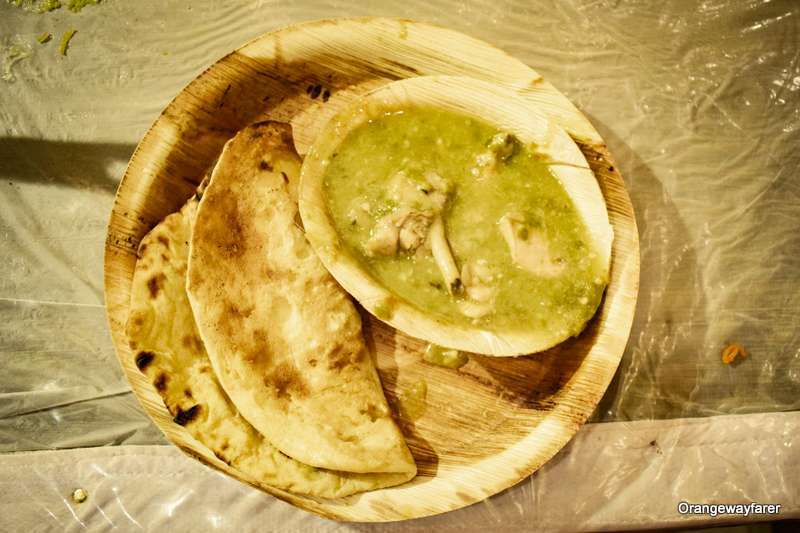 These dishes look delicious, would love to give them a try when I go back to India!